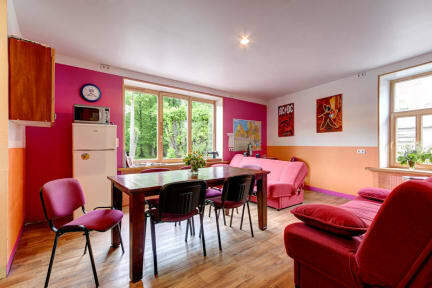 Travellers Beach Hostel i Liepaja, Latvia: Bestill nå! Complete booking cancellation less than 1 week of arrival results in first night charge. Adding or subtracting a few people - just email us with final numbers 1 week prior to arrival so we can allocate beds and adjust the price where possible. Please Email us about tours you are interested in so we can allocate staff to be ready for you. All our hostels have certified Fire Security systems so you can sleep more comfortable at night than is possible at many other hostels in Riga. We have more than the minimum amount of showers and toilets which is much more than you would have experienced elsewhere in Riga. We are most likely the only hostels in Riga that pay all taxes. So for price and location you receive an ethical lowest priced solution. Some other Riga hostels do not even accept credit cards to avoid declaring income! We have dedicated Tour guides so please email us if you would like to pre arranged tours. Or just look at our Whiteboard in reception to see the latest offering. We cater to families and older travellers as well as many young folk looking for new adventures. Therefore we believe you will experience a good mix of people and conversation in our Common Room. Stag and Bucks groups looking for their type of fun are not allowed to stay at Argonaut. PLEASE INFORM US DURING YOUR STAY IF THERE IS ANYTHING WE CAN DO TO MAKE YOUR STAY MORE ENJOYABLE. Please email us if you have any comments or suggestions that you would like to communicate directly. BOOKING CHANGES CAN NOT BE PROCESSED VIA EMAIL. Velkommen til Liepaja Beach Hostel, topp beliggenhet i gamlebyen i Liepaja mellom stranden og gamlebyen. Vi vant Hostelworld Best Hostel Latvia for vårt Funky Hostel i Riga! I Liepaja og Riga imøtekommer vi hovedsakelig utenlandske reisende.